"Trying to keep up with the Joneses will actually keep you back. You may be envious of their spending habits now, but they’ll likely envy you when you’re debt-free." The average American household now carries more than $134,000 in debt (including mortgages). Let that sink in for a second. That’s 2.4 times the median household income of $55,322. In other words, many of us are drowning in debt. That kind of burden takes up a lot of headspace, whether you’re thinking about making each monthly payment on time or avoiding creditors if you can’t afford to. All that focus on debt also limits our ability to save for the future and meet other financial goals. It also, perhaps obviously, increases stress and anxiety. One study found that people who struggle with debt are more than twice as likely to suffer from depression; another report links debt to higher death rates. So getting out of debt isn’t just a positive financial move—it’s good for your health, too. What’s the best way to pay off debt? Follow this step-by-step guide to devise a plan to successfully pay off any kind of debt you might have. Then dig deeper with tips on how to specifically pay down credit card debt, student loans and outstanding medical bills faster. Step #1: Get in the right mindset to pay off debt. The first step in accomplishing any big goal is to get into the right mindset. This might require rethinking some of the assumptions that have either gotten you into debt or are keeping you there—from not believing it’s possible to be debt-free one day to thinking you earn too little or that you’ll have to make painful sacrifices in order to make it happen. Debt is the biggest barrier to building wealth. Trying to keep up with the Joneses will actually keep you back. You may be envious of their spending habits now, but they’ll likely envy you when you’re debt-free. Step #2: Organize your debts and pinpoint what’s most urgent. A little organization goes a long way when you’re figuring out which credit card, loan or overdue bill to pay off first. Make a list of everything you owe, noting the balance, minimum payment, due date and interest rate. You should be able to find this information on your statement (and online). Once you review it all in black and white, it’s easier to understand which debts are most urgent. If you’re in a position that requires you to choose which bills to pay this month, focus on the essentials—like staying current on your rent or mortgage and utility bills to keep a roof over your head and the lights on. If you have a car payment and need that car to go to work, that should be next on your list. Assuming you can cover your bills and are focusing on becoming debt-free, the next step is deciding how to prioritize the debt you’ve laid out. Step #3: Research the ‘avalanche method’ and ‘snowball method’ of paying off debt. Two common approaches to paying off debt are prioritizing by interest rate—known as the debt avalanche method—or according to balance, known as the debt snowball method. 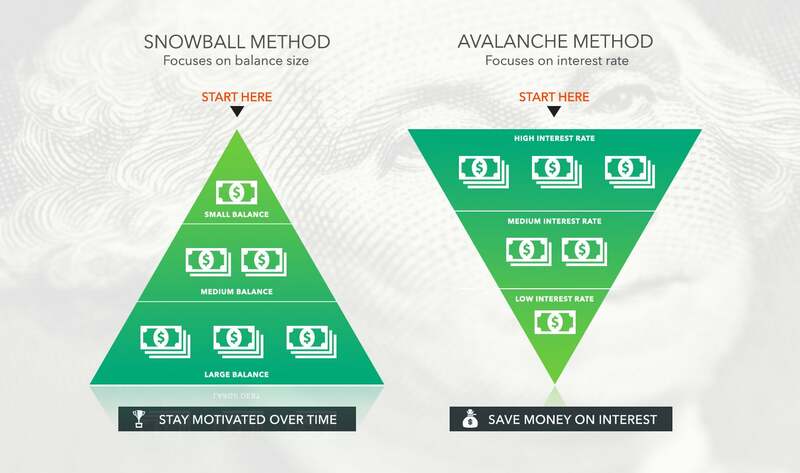 Avalanche method: This strategy focuses on eliminating high-interest debt first. List your debts in order from highest interest rate to lowest interest rate, and start at the top—devoting as much cash as possible to the first loan, while making minimum payments on the others. Once you wipe it out, move to the one with the second-highest rate. Snowball method: In this case, you prioritize debt according to the balance owed, regardless of interest rate. List your debts in order from smallest balance to largest, and start at the top. Once you’ve paid off the smallest loan—while making minimum payments on the rest—move on to the second-smallest balance. Step #4: Select the debt payment method that works best for you. Both the avalanche method and snowball method work well for paying off debt, but offer different advantages. With the avalanche method, you end up saving more money over time. Here’s why: When you pay off a debt slowly with minimum payments, much of your monthly payment is applied to interest in the beginning; the percentage of interest included in your payment decreases as you get closer to a zero balance. When you pay more than the required minimum amount, you’re able to cut through the interest faster. With the avalanche method, you’re putting more toward the balance of your highest interest debt first, so you’ll pay less in interest over time. While the avalanche method may be the most cost-effective strategy, it may not help with the mental effort required to get out of debt since your highest interest debt may also be your largest. Because the snowball method focuses on paying off small debts first instead, it allows you to experience small successes along the way. Fully paying off small balances can give you the psychological boost to keep pushing forward. Selecting a method depends on your personality and preferences—and you’re not married to your first decision. If you try the avalanche method and find that you’re losing motivation, switch to the snowball method to see if it’s a better fit. You’ll be surprised at how far these little payments can take you on your debt journey. Small, incremental payments can ultimately yield big successes. Click the arrows below to learn specific strategies for paying off credit card debt, student loans and outstanding medical bills.